I think I posted one picture from this sequence a couple of weeks ago, but I figured today it would be fun to post the whole thing. This is standard behavior around here when everyone wakes up from their naps and wants to play. If I’d had my wits about me, I would have put the camera into movie mode so you could enjoy the whole thing in real time, but I didn’t. 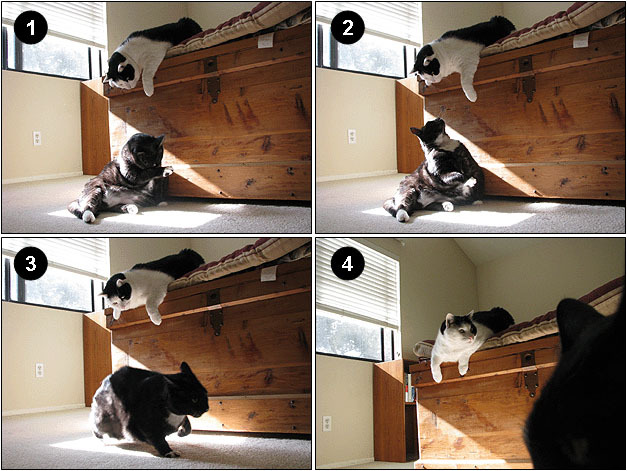 So here it is in photos instead: Inkblot and Domino, playing in the sunshine. As usual, by the time it’s all over Inkblot isn’t quite sure what happened.